Cruising Down The River is the top song in America for nine weeks, albeit in two different versions. 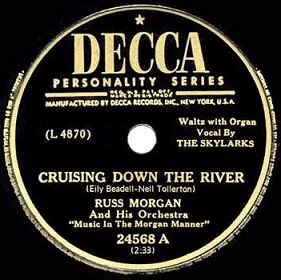 The current #1 record is held by Russ Morgan who knocked off Blue Barron’s version of the same song in the top spot and becomes the bigger seller overall, staying atop the pop charts for seven weeks (compared to two for Barron). The song was a huge hit in England in 1946, written by two middle aged women who won a publicly sponsored songwriting contest with it in 1945. As for the American adaptions in 1949 their takes on it are remarkably similar in every way, featuring the vocals done by female choruses over an accordion led track. This lack of variance was not unusual for the era as in this case there were five Top Thirty versions using the same arrangement vying for airtime. Rock’s ascent into the mainstream would change this, as it became the specific performance rather than the song itself that buyers would seek but the upper reaches of the Pop Charts were the last to feel this change which wouldn’t fully take place there for another couple of years. 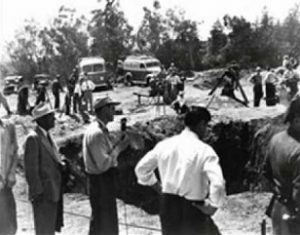 On April 8, 1949 a three year girl named Kathy Fiscus fell into an abandoned well in Los Angeles which captivated local residents desperately hoping for a miracle as they watched the events unfold thanks to the advent of television. The relatively new KTLA TV station had reporter Stan Chambers cover the tragedy live, unsure of how long it would last but once he was on the scene he became the eyes and ears for the entire community and the station kept filming non-stop as they had nothing else to switch to. For thirty consecutive hours they remained live on the air – no interviews, no charts and graphs, no expert testimonies or cutting back to the studio for fresh takes from other personalities… most of that wasn’t even possible then. The station wasn’t even sure if anybody would be watching, TV had only recently come to Southern California, few people owned them, and there was even a thought that staying on the air uninterrupted for that long might melt the transformer… yet they didn’t cut away even as the hope that she might somehow still be alive grew less and less likely. After Fiscus’s body was recovered the station learned that Los Angeles had been riveted to the sets, if not their own then their neighbors and those showing it in store windows. What the incident proved was television had a visual immediacy that became its greatest asset, giving people the ability to see what was happening AS it happened, wherever they were, as if they too were there. Radio couldn’t compete with that aspect of reporting any longer, nor could newspapers, and each had to adjust their own tactics to compensate in the future. Although the tragedy wasn’t seen nationwide and despite it not pioneering anything in a technical sense, it simply reinforced and then built upon what was already becoming apparent. That television offered a unique window to the world, a world which because of television would never be the same again. Looking to add prestige and dignity to their drab state of affairs The Masters Golf Tournament awards a green jacket to their winner for the first time. The championship held annually at Augusta National Golf Club in Georgia each April was in its thirteenth year and the idea for a garish jacket was the club’s co-founder Clifford Roberts, presumably so the grubby golfers would be in proper attire when getting drunk in the bar after the last round. Roberts was also a notorious racist who once insisted that as long as he was alive all the golfers at the club would be white and all the caddies would be black. He thankfully died in 1977 but Augusta National still was a bastion of racism and sexism into the twenty-first century. Luckily they’re easy to spot with their ridiculous green jackets. Don’t worry if you have nothing to wear a green Brooks Brothers jacket with, the Augusta National rules also stipulate that the jacket must remain on the grounds of the club starting one year after it’s won, thereby sparing the public from encountering old golfers stumbling around restaurants in plaid pants and green jackets claiming to be someone important. The first green jacket was won by Sam Snead on his way to a record 82 PGA tour events victories, as he beat the field by three strokes to capture the first of three green jackets in his Hall Of Fame career. 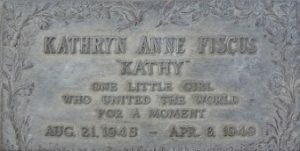 A fire at St. Anthony’s Hospital in Effingham, Illinois kills 74 people, including many patients, newborn babies among them, nurses, nuns and priests who helped run the hospital and the hospital superintendent himself… but oddly no doctors who were apparently all playing golf, with or without green jackets. The tragedy was caused by a laughably outdated building with absolutely no safety provisions. The largely wooden structure dated back to 1873 and was filled with highly flammable materials, had no sprinklers or fire alarms and was plagued by a poorly designed layout with wide hallways and openings which caused the fire to easily spread. 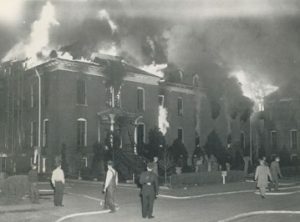 The grisly silver lining in this tragedy that saw more than half those in the building at the time the fire broke out being killed in the blaze was that the resulting negative publicity over the building’s extensive deficiencies spurred a national reappraisal of hospital safety regulations which led to the adaption of more universal codes for minimizing fire hazards. The Looney Tunes short High Diving Hare debuts featuring typical obstinacy by Yosemite Sam who is determined to see the featured attraction at a vaudeville show, that of Fearless Freep, a high dive act who “Dares Death” each night… until he can’t make this particular show due to a storm that delays his arrival. The perpetually ornery Sam orders the show’s MC Bugs Bunny to perform the feat himself, diving 500 feet into a bucket of water on stage. 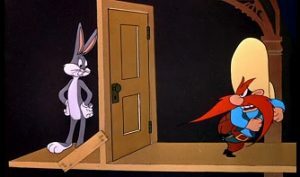 Despite Sam being armed to teeth and having absolutely no aversion to firing his pistols at any provocation, real or imagined, Bugs manages through little more than a series of clever bait and switch tactics to avoid plummeting to his doom by instead having Yosemite Sam continually take the fall himself. Directed by the great Friz Freleng the short has a timely joke for music lovers drawn from the Dusty Fletcher vaudeville skit that he and others, notably Jack McVea, scored big with on the record Open The Door, Richard immediately prior to rock’s arrival as the dominant form of black popular music. 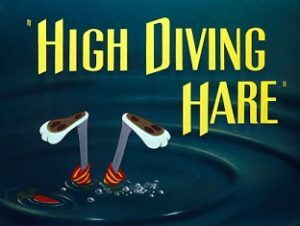 In the cartoon Sam is on the high dive board where Bugs constructed a door ostensibly to keep Sam away from him prompting the short orange haired hothead to knock repeatedly, telling him to “Open the door!” before turning to the audience and commenting in a sly aside, “Notice I didn’t say Richard?”. This was one of the few times in that era where a reference to black popular culture was inserted into cartoons without it being derogatory and yet was still widely known enough to be universally recognized and draw laughs. Of course it was immediately followed in the skit by a stereotypical Indian routine perpetrated by Bugs so there was still a ways to go in that regard. As for Yosemite Sam, despite continually falling 500 feet into the water, not to mention through the stage floor and while holding an anvil for added emphasis, he nevertheless manages to keep returning to climb the ladder for more of the same, so maybe the high diving act wasn’t as quite death defying as advertised and therefore not worth the fifteen cent admission he’d paid in the first place. April means it’s time for Spring Cleaning and what better way to tackle such a dirty job than with a new Hoover Vacuum Cleaner. This Three Action cleaner beats, sweeps and cleans because as they so thoughtfully inform you, Life is too short to clean the hard way. 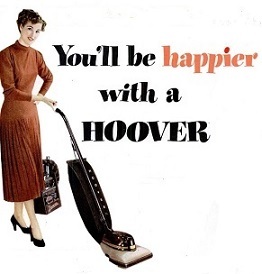 But you don’t have to do this thankless task the hard way any longer because this state of the art vacuum cleaner can now be yours for just $79.95… plus an extra $19.95 for the additional cleaning tools in a handy kit. It may sound like a lot but while “dirt cheap” may be a popular saying to lure you into buying something the fact is cleaning dirt is more expensive.